Excitement is building (along with the brand spanking new for 2013 set) as the finishing touches are being put to Hailsham Theatres’ pantomime, “Alice in Wonderland”. It is being performed at the Hailsham Pavilion which is possibly the best venue for a lovely theatre outing – comfy seats, bag of sweets, cup of tea (don’t let the Mad Hatter drink it all), and a fantastic cast – young and a bit older! What more could you wish for? Join Alice with her mother Gladys (probably a man in a frock but no one’s too sure!) as they make friends with the White Rabbit (running late of course!) who will take them to Wonderland. They’ll meet a pack of marching cards, the Cheshire Cat and we mustn’t forget the “oh so mean” Queen of Hearts and her ghastly spoilt brat of a daughter. There’s a handsome prince and two hapless chaps Tweedledum and Tweedledee (not a brain cell between them) to create the usual mayhem and confusion. The audience will also be expected to work hard – so bring your best cheers and boos with you and we’ll see you all there! 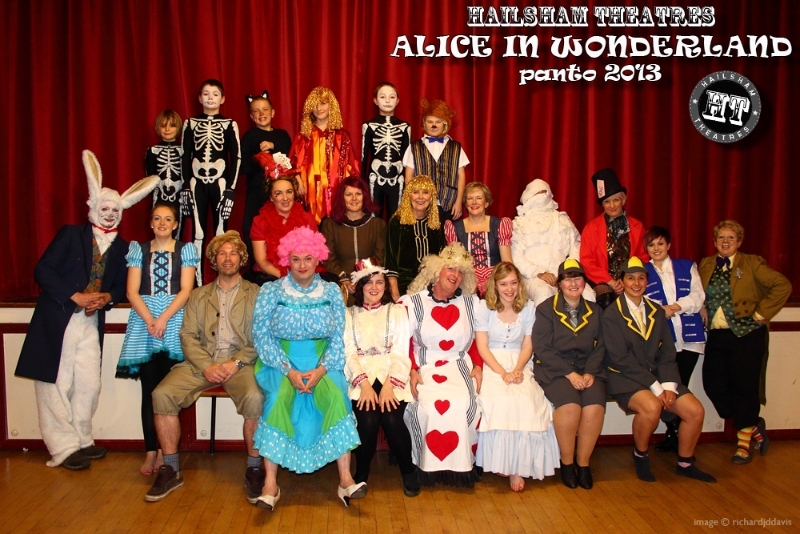 Alice in Wonderland runs from 22 January – 27 January 2013 at the Hailsham Pavilion. £7.50 Adults £5.50 U16/Concessions. Book online via www.pavilionhailsham.co.uk or call the Hailsham Pavilion Box Office on 01323 841414.